A motivated and ambitious team in an upscale, versatile environment awaits you. If you - like us - want to work in a service-oriented family environment and have fun, to prepare people a good time, we look forward to your written application including your salary expectations and your earliest possible starting date. If no place be advertised or not fully apply to you, please do not hesitate to send us your application yet. We welcome any unsolicited application. For questions and information please contact us gladly. You have already gained experience in the fine dining and are therefore accustomed to take responsibility and to work at a high level? Additionally, if you have team skills, a neat appearance and quality awareness, we look forward to receiving your documents. We offer a 5-day week with regular working hours and mostly free Sundays. 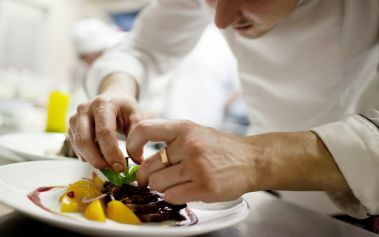 You have already gained experience in the fine dining and to work at a high level? You have recently successfully completed your school and want to start your training in this area in a motivated team? You are independent, friendly, creative, a team player and your positive appearance, your motivation and your ambition characterises you? We look forward to your written application and your earliest possible starting date. For questions and information please contact us gladly.